The evaporative cooling is one of the most efficient methods to save energy and cool a room. Your consumption is less than the alternatives It is also considered environmentally friendly because the process does not require chemical agents that could damage the ozone layer. Based on the physical phenomenon of evaporation, it is only necessary a small amount of water to start the process. The hot air is pushed to pass through an high efficiency and long lasting antigerm fabric, through this fabric circulate water in a close circuit. The outside temperature is reduced by the evaporative process, and so is the cooled air introduced into the building by the fan. Reduced water consumption due to its circulation in a closed-loop. It delivers 100% fresh air without impurities. The conditioners clean the air, using 100% of fresh and new air. 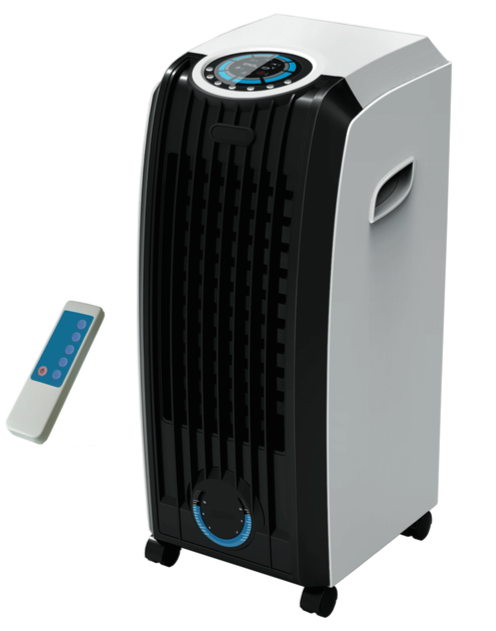 It does not dry the air as conventional ventilation equipments. The humidity is maintained, resulting beneficial to our body, animals, plants … Especially recommended for allergic and asthmatic persons, as those who suffer from migraines or have dust or mites allergy. Relative humidity on the air. Evaporable capacity of water (depending on the temperature and hardness). Ventilation capacity of the location. Remote control and control panel. Water curtain system free of germs. Ability to add ice cubes. With wheels for a better mobility.